This article is about the Carolina Panthers tight end. For the similarly named Jacksonville Jaguars offensive coordinator, see Greg Olson (American football). Olsen with the Panthers in 2013. Gregory Walter Olsen (born March 11, 1985) is an American football tight end for the Carolina Panthers of the National Football League (NFL). He played college football at the University of Miami, and was drafted by the Chicago Bears in the first round of the 2007 NFL Draft. Olsen grew up in Wayne, New Jersey, and attended Wayne Hills High School, where he played football and basketball under his father Chris Olsen, Sr. As a high school senior he was one of three finalists for the Gatorade Player of the Year award along with former Miami Hurricane teammate Kyle Wright. He was a USA Today First-Team All-American as a senior in 2002. He finished his career with 73 receptions for 1,474 yards, and a school-record 27 touchdowns. He played in the 2003 U.S. Army All-American Bowl. Considered a five-star recruit by Rivals.com, Olsen was listed as the No. 2 tight end in the nation in 2003. In track & field, Olsen competed in the throwing events and as a sprinter. He recorded a personal-best time of 11.40 seconds in the 100 meters. He placed 2nd in the shot put event at the 2003 NJSIAA Meet of Champions, recording a career-best throw of 18.03 meters. He also had top-throws of 46.63 meters in the discus throw and 52.83 meters in the javelin throw. Olsen originally enrolled at the University of Notre Dame but transferred as a freshman to the University of Miami in 2003. In 2003, Olsen was on the Hurricanes' scout team before suffering a shoulder injury and was redshirted. He became the starter of the Miami Hurricanes in his sophomore season in 2005 after Kevin Everett was drafted in the third round by the Buffalo Bills. In his career he totaled 87 receptions for 1215 yards and six touchdowns. In 2003, Olsen was one of the players that participated in the University of Miami's rap group, the 7th Floor Crew, under the pseudonym G-Reg. Many media sources ridiculed Olsen for his involvement in the group, which earned national notoriety for their sexually explicit and vulgar lyrics. Olsen addressed the media about the issue almost a week after the draft. He apologized for his actions and stated he had moved on. Olsen playing for the Bears in 2008. The Chicago Bears selected Olsen as the 31st overall pick in the 2007 NFL Draft. He signed a five-year contract with the team on July 3, which made him the first of the draft's top sixty-four picks to come to terms with their team. 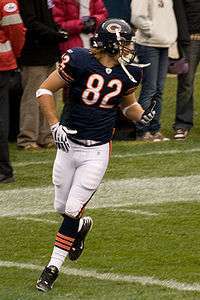 Olsen sustained a knee injury during the Bears' final preseason game in 2007, and consequently, he missed the team's first two games while recovering. He made his NFL debut on September 23, 2007 against the Dallas Cowboys, catching two passes for twenty-eight yards. Olsen caught his first touchdown two weeks later during a Week 5 match-up against the Green Bay Packers. Olsen finished the season with 39 receptions for 391 yards and two touchdowns. Olsen saw his playing time increase during his second season. He started 7 of 16 games, making 54 receptions for 574 yards and five touchdowns. He led the team in receiving touchdowns, while finishing second in receptions and receiving yards. Olsen was selected as a second alternate for the 2009 Pro Bowl. Chicago's Comcast SportsNet named Olsen the Bears Player of the Year. In 2009, Olsen quickly developed a rapport with Jay Cutler, whom the Bears had acquired from the Denver Broncos. Olsen and Cutler connected for 60 receptions, for 612 yards, and eight touchdowns. He led the Bears in receptions and touchdowns, while finishing behind Devin Hester for most receiving yards. Before the 2010 season the Bears fired Ron Turner and hired Mike Martz as offensive coordinator. His numbers dropped compared to his 2008 and 2009 seasons, as he recorded 41 receptions for 404 yards, and 5 touchdowns. However, Olsen helped the Bears win their first 2011 playoff game against the Seattle Seahawks, catching three passes for 113 yards and two touchdowns. On July 28, 2011, Olsen was traded to the Carolina Panthers for a 2012 third round draft pick. During his first year with Carolina, Olsen caught 45 receptions for 540 yards from panther's quarterback Cam Newton. He also recorded 5 touchdowns. Through the first six weeks of the 2014 season, PFF rated Olsen as the best tight end in pass block efficiency and receiving. Through the first 7 weeks of the season, Olsen led all tight ends in receiving yards with 493, and had recorded at least five catches and 60 yards receiving in all but one game throughout the year. Olsen finished the regular season with a career-high 84 catches, 1,008 receiving yards, as well as 6 touchdowns en route to the Panthers second consecutive NFC South division title. Olsen finished third in the NFL for receptions by a tight end and second for both yards on the season and yards per game. It was Olsen's first 1,000 yard receiving season. For his efforts during the 2014–15 season he was voted to the 2015 Pro Bowl. Playing for Team Carter, Olsen had three receptions for 53 yards and two touchdowns. On March 5, 2015, The Carolina Panthers signed Olsen to a three-year extension worth $22.5 million. The extension includes a $12 million signing bonus with an average annual salary of $7.5 million, according to Olsen's agent Drew Rosenhaus. Olsen proved especially valuable to the Panthers in 2015, as teammate and #1 wide receiver Kelvin Benjamin suffered an ACL tear and did not play for the entire year. Olsen was tasked with being the main target of soon-to-be NFL MVP Cam Newton, and performed well. During the Panthers week three matchup against the New Orleans Saints, Olsen caught 8 passes including two touchdowns and a career high 134 receiving yards. He also tied a career long reception of 52 yards. Through the first four weeks of the season Olsen had 17 receptions for 243 yards and 2 touchdowns. Olsen continued his high level of play during a week 6 matchup against the Seattle Seahawks. Olsen caught 7 catches for 131 yards along with a game winning touchdown with under a minute to play. The touchdown helped keep the Panthers undefeated season alive as they improved to 5–0 on the season. Olsen played well against the New Orleans Saints again later in the season. Olsen recorded 9 reception, including one on 4th down during the Panthers final drive, and 129 yards. Through the first 13 games of the year Olsen recorded 65 receptions for 969 yards and 6 touchdowns. During the 2015 season Olsen set Panthers records for career receiving yards and receptions for a tight end, both were held by former Panther Wesley Walls. During the Panthers' 41-38 victory over the New Orleans Saints to improve them to 12–0, Olsen caught nine passes for 129 yards and, during the game, passed Wesley Walls for most career receptions by a TE in Panthers' history. Olsen finished the 2015 regular season with 77 receptions with 1,104 yards and 7 touchdowns. Olsen was selected for his second consecutive Pro Bowl. He was also selected to the AP All-Pro second team. According to PFF, Olsen ranked as the 2nd-best receiving tight-end in the NFL, behind only Rob Gronkowski. In the NFC Divisional Round, Olsen hauled in six catches for 77 yards and a touchdown to help the Panthers to a 31-24 win over the Seattle Seahawks and an NFC Championship game matchup with the Arizona Cardinals. He caught six passes for 113 yards against the Cardinals to help the Panthers to a 49–15 win and a Super Bowl 50 berth against the Denver Broncos. In the Super Bowl, Olsen had 4 catches for 41 yards, but the Panthers lost 24-10. Olsen's older brother, Chris Jr., played quarterback for the University of Virginia in Charlottesville, Virginia. His brother also tried out for a spot on the Bears' roster, during their rookie mini-camp in May 2007, but was not offered a contract. Younger brother Kevin was recruited heavily by several D1 schools, before deciding to play at Greg's alma mater, Miami. After incidents during his freshman and sophomore years, Kevin was dismissed from the team and the university. Kevin recently signed with the Charlotte 49ers and will live and play in the same town as his brother Greg. Olsen founded Receptions For Research: The Greg Olsen Foundation in 2009, which helps fund cancer research. Greg’s mother, Sue, is an 11-year cancer survivor and the inspiration for his foundation. One of his fundraising events includes Kicks for a Cure Kickball Tournament, the world’s largest charity kickball tournament. The large scale event is held annually each summer in Chicago’s Grant Park and hosts over 1,000 people. Kickball teams compete and have fun in an effort to raise money for cancer research. Greg and wife Kara welcomed son Tate Christian Olsen in early June 2011. In April 2012, he announced that they were expecting twins. On October 9, 2012, twins Talbot and T.J. (Trent Jerry) were born. T.J. was born with a very rare congenital heart condition known as Hypoplastic Left Heart Syndrome, or HLHS. Talbot was born without complications. ↑ Biggs, Brad. "Aromashodu says coaches can't expect everyone to be perfect: Receiver adds coaches sometimes call the wrong plays", Chicago Tribune, September 29, 2010. Accessed March 31, 2011. "Tight end Greg Olsen, who grew up in Wayne, N.J., not far from New Meadowlands Stadium, will be playing near home for the first time since high school." ↑ Greg Olsen profile, National Football League Players Association. Accessed July 24, 2007. ↑ Mayer, Larry, Bears first NFL team to sign first-round draft pick (July 3, 2007), chicagobears.com, Retrieved on July 4, 2007. 1 2 Mayer, Larry, Back on practice field, Olsen hopes to play Sunday (September 12, 2007), chicagobears.com, Retrieved on September 26, 2007. ↑ Seligman, Andrew, Dallas 34, Chicago 10 (September 24, 2007), Yahoo! Sports, Retrieved on September 26, 2007. ↑ Mayer, Larry, Bears turn to tight ends to give offense a boost (October 8, 2007), chicagobears.com, Retrieved on October 8, 2007. ↑ "2008 Chicago Bears". pro-football-reference.com. 2008. Retrieved 2009-01-04. ↑ Mayer, Larry (2008-12-16). "Veteran linebacker Briggs voted to fourth straight Pro Bowl". chicagobears.com. Retrieved 2009-01-04. ↑ Mayer, Larry (2009-01-28). "Olsen to be feted at annual Comcast sports awards". chicagobears.com. Retrieved 2009-01-29. ↑ Smith, Michael David (2011-01-16). "Greg Olsen Shreds Seahawks, Shows Value of Tight End in Mike Martz Offense". NFL Fanhouse. Retrieved 2011-01-24. ↑ "Olsen inks 3-year, $22.5M extension". ESPN. Retrieved 5 March 2015. ↑ "Chicago Bear Greg Olsen Talks About Kicks For A Cure". ↑ Mayer, Larry (2012-10-26). "Hester vows to play with more aggressiveness". Chicago Bears. Retrieved 2012-10-26.